Social media has changed how we live, and surprisingly, how we die. Mortality used to be an intimate affair shared between families and close groups of friends, but that’s no longer the case. People now broadcast the passing of their loved ones across the internet to an audience of potentially billions. This raises an interesting question: are social media platforms, which are rife with trolls and aggressive advertising, appropriate vessels for collective grieving? Mark Alhermizi, founder and CEO of Everdays, has his doubts. These concerns, combined with research that dragged him to funeral director conferences worldwide, led him to launch a social service that connects people in mourning. 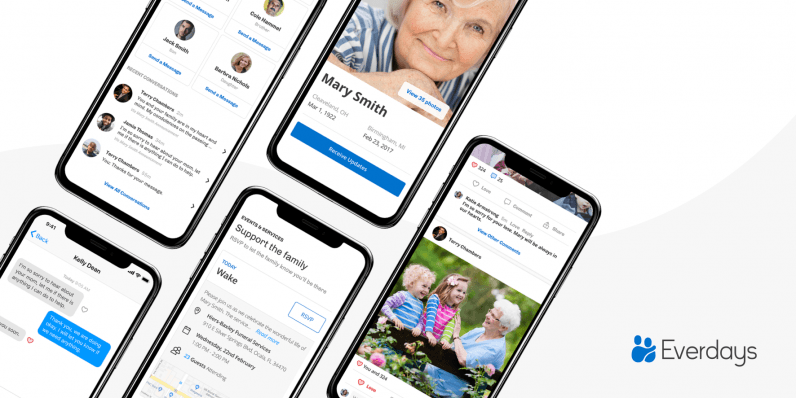 Everdays, Alhermizi explained, is a platform that connects people during what he euphemistically calls “milestone life events.” By that, he means death. “We could very loosely be described as the Facebook of death,” he said. The parallels are undeniably there. Everdays has much of the functionality you’d expect from a social network. For example, it lets users privately share user-generated content about the deceased, like tributes and photographs. They can lend a kind ear to the deceased’s nearest-and-dearest through private messages. There’s also an events function, which allows the next-of-kin to invite others to wakes and funerals. The most significant difference is that while Facebook is one massive social network, Everdays works on a vastly smaller scale, with each passing its own tiny social network among thousands. People connect via their relationship to the deceased or their family, which acts as a firewall to potential trolls. Everdays communities also stand as a perpetual memorial to the deceased. As Alhermizi explained to me, users can revisit communities on anniversaries and birthdays, look back on previous posts, or share new tributes and memories. This approach is in stark contrast to Facebook, where pictures and threads are standalone and inevitably buried under mountains of new content. The funeral home industry is deeply conservative, steeped in tradition and protocol. Many are family businesses, passed down from generation to generation. This goes some way to explaining their reluctance to embrace social media, with less than three percent of funeral directors having a presence on Facebook. “The industry, both nationally and globally, has not embraced Facebook. In fact, they shun it. The reason for this is that they don’t feel like this is an appropriate forum for conveying this kind of information,” Alhermizi said. This reluctance is observable in the general public. “Family members aren’t excited about posting about the passing of their father next to a post of a dancing cat, or whatever inappropriate, irrelevant subject matter that tends to be floating on Facebook,” he added. The challenge of Everdays is therefore twofold. First, it’s got to make inroads into an industry that’s profoundly traditional and unwilling to change. The company has made some progress here, with around 0.5 percent of deaths in the United States using its product, connecting 1.5 million bereaved relatives and friends. While that doesn’t sound like a lot, it’s fairly substantial when you consider the size and scale of the US. According to the most recent CDC statistics, around 2.7 million died in the US in 2015. That’s more than half the population of New Zealand. Secondly, it’s got to change the general public’s relationship with technology and death. Everdays has to attract those that avoid technology in this respect, while simultaneously coaxing those already using Facebook to communicate bereavements into using their platform. That will undoubtedly be a lot harder, but Everdays has a strong product, and Alhermizi has thought long and hard about this problem. It emphasizes privacy and the “ownership” of a passing. By design, it protects loved ones from “grief trolling,” which unfortunately is a thing. There’s no chance that an algorithm will analyze your distraught posts announcing the passing of your grandmother and use it to sell you something. After a period operating in stealth, Everdays is now available to the public. Users wishing to check it out can download the app on Android and iOS here.